This morning, I woke up with hope in my heart, for the first time since November 9, 2016. What a difference a year makes. In 2017, a transgender woman beat the incumbent conservative who introduced the anti-trans bathroom-bill in Virginia. And she did it by running on a platform of traffic reduction. The boyfriend of a victim of gun violence beat the delegate with an “A” rating from the NRA. A civil rights attorney who sued the police department on behalf of Black Lives Matter became a prosecutor in Pennsylvania. For more inspirational stories from the 2017 election, see this article from the Washington Post. I know there is still a huge fight ahead, but I’m ready. My exhaustion and depression are slightly subsiding. So yes, I have had my fair share of ice cream in the past year. Also, wine, cheese, bread, and even the occasional sheet cake – eaten with a fork straight from the box. Sometimes, I feel ready to fight all day every day, and other days I want to drink wine and hide from the world. Some days, I feel both in the same day, or even the same hour. I think you can see, the year has taken a toll. I swear I’ve aged ten years since November 9, 2016. Every single day since the election, I feel that I must do battle to protect our democracy. Because every SINGLE day, the administration does something to dismantle it. Often times, I feel like I’m living in a weird dystopian novel…and I just want it to end. There are a lot of people out there struggling and hurting during this presidency – people who you may not even imagine, because they keep their political views under wraps. If I can be a sounding board, I hope that it takes some of the daily burden of living in the post-Trump era off of them. More than that, I hope to encourage people to channel their frustration into action, and be more involved in our political process. Granted, I have lost friends because of my political activism and transparency. But those who do not like me – because I am outspoken about preserving our democracy, protecting our children from gun violence, and standing up for those most vulnerable in our society – are not really people whose opinions matter much to me. And I’m not just sitting here on my computer all day, lamenting the downfall of our democracy on social media. I have seriously increased my political activism. I have always been politically active, kept up on the news, and voted (in every election since 1992). In the past year, I’ve taken it to a new level – participating in multiple protests, joining political organizations, contacting my representatives on issues weekly, volunteering to register voters and signing up to be a poll worker in 2018. The increase in political awareness and social activism across this country is the big upside of the past election. The more women, people of color, and LGBTQ folks that are involved in politics – either by running, contacting representatives, and most importantly, VOTING – the better the future of our country will be. The election results of 2017 show that this is already happening. I am optimistic about the future now – one where we work together for the common good. My hope is we reject divisive politics and focus on actual issues and solutions (like health care, and infrastructure, and climate change) – instead of arguing about who stood or knelt, or prayed or didn’t, or said Merry Christmas or Happy Holidays. I know this past year has been rough friends, but I hope that you are feeling better too. I hope you feel energized to take action. I hope you will join me in putting down the bowl of ice cream and getting to work. The 2018 election will be here before we know it. Posted in Politics & Other "off limits" topics and tagged activism, election 2016, election 2017, politics, Resistance, Trump. Bookmark the permalink. It’s been months since I blogged, for reasons I don’t totally understand. I’ve been extremely active on social media – you can follow my Facebook page or connect with me on Twitter. I guess I just like the interactive quality of those channels better. I’d love it if you follow me there and we can chat. This week, post-Charlottesville, was incredibly hard for a lot of us. I think, for me, the hardest of any so far. And that is REALLY saying something. Even as bad as I thought it would be – and “believe me”, I thought it would be bad – I did not expect our President to be threatening Nuclear War over Twitter and outright supporting neo-Nazi’s and White Supremacists. I feel like we are living in some type dystopian future and I really, really want the book to end. Nevertheless, we must persist. So I write my representatives, donate to good causes, sign petitions, attend rallies (not sponsored by hate groups), keep up on the news, and share information through social media. Posted in Politics & Other "off limits" topics and tagged Charlottesville, politics, Sheetcaking, surviving, Trump. Bookmark the permalink. I’m been lying low on all things social media (and all things social for that matter) for about a week now. Things were getting a little too heated and ugly for me. I needed to take a break. My “ness” and I crawled back into our protective little shell. It all started last Tuesday, with the announcement of the winner of the Presidential election. When I heard the news, I was elated. After celebrating with friends at home, I was feeling great. Then, I made the mistake of checking Facebook to connect with friends and family. That’s when things went downhill – fast. It wasn’t the “I’m disappointed” or “feeling sad” comments. I totally get that. I was aware that just under half of the population of our country was disappointed. They did not share my enthusiasm. It wasn’t that, but rather the cries of “the idiot vote won”, “were all f*cked”; along with the name calling – “Muslim”, “Socialist”, and “The Anti-Christ”. All of these posts from people I actually know – like in real life. I don’t know why I couldn’t ignore it. I don’t know why I let it bother me. I don’t know why I didn’t just put down the iPhone and move on. Instead, some combination of stress, too much celebratory champagne, and a raging case of PMS, led me to respond to a few people. I regret that. The thing I regret the most is that I let them steal my joy. Which is not their fault. Nope. That’s all mine. The next day I woke up feeling sad and depressed and embarrassed by my outburst. I tried a couple of times to get back on Facebook to apologize, and even wrote what I thought was an inspirational blog post. But, it didn’t make me feel any better. I realized that what I really needed was to put myself in a timeout…to take a break from all things social media, until cooler heads (mostly mine) prevail. I’m not sure why I take it all to heart so much. It’s not that I expect everyone to agree. I don’t even think that we should. I certainly don’t expect people to see things the exact same way I do. As a self described “tree-hugger” living in South OC, I’m used to being in the minority most of the time. I think it’s that I just so desperately want people to be reasonable, and rational, and deal in facts and numbers and math. I also want people to not be hateful. And every once in a while, approach problems with an open mind. And if they are going to use words like “Muslim”, “socialist”, and “anti-Christ”, have some idea what those words actually mean. Hey, I was no fan of George W. Bush, but he was our President. When he was re-elected, I didn’t think the world was ending, or that it wasn’t fair, or that people who voted for him were all morons. I just realized I was not part of the majority vote, hoped for the best in the next four years, and vowed to make a difference locally with the issues that were important to me. While I didn’t like Bush’s policies, I didn’t hate him as a person. I tried to make light of the situation. Here is a picture I took one time in the Houston airport. 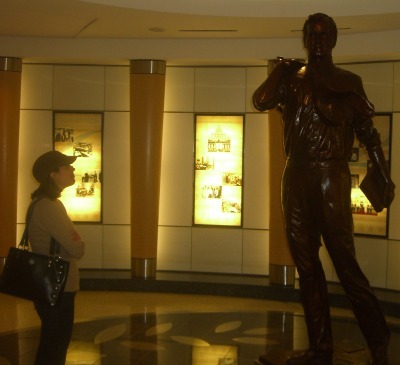 I was staring down a statue of Bush Sr. I captioned it “making peace with the man who brought us GW”. I still hold out hope that instead of fueling more hatred and division, this election will cause us to pull together to work on the things we agree on. Every time I see a clip from Fox News or an interview with John McCain, that hope dies a little bit inside, but there is still an ember burning there. In my mind, the short list of things we agree on goes something like this – healthy, educated children; stable jobs and some security in retirement; clean air and water; and a democracy that really does work by and for the people. The good news is that polls suggest that the vast majority of American people do want this. In the real world (not the extremes we see on TV), most people lean more toward the middle. If we agree that we want a government that works for the people (rather than special interests and companies that spend the most money on lobbyists), there must be compromise – on both sides. If everyone digs their heels in and doesn’t budge, nothing will get done. Which, I can’t imagine is good for anyone – except maybe the cable news networks pumping their audiences full of propaganda and carefully manipulated numbers (which does not equate to facts and math by the way). I also don’t take myself so seriously that I believe anyone cares about my political opinions. But it’s my blog so I figured, I can write a post just for me – and I feel a little bit better now. Maybe even better enough to dip my toe back into the Facebook waters again. With a little more trepidation and a little bit thicker skin this time. Posted in Politics & Other "off limits" topics and tagged current-events, election, Facebook, politics, President, reactions, social media. Bookmark the permalink. On my drive to vote yesterday, I pulled over to snap this photo. 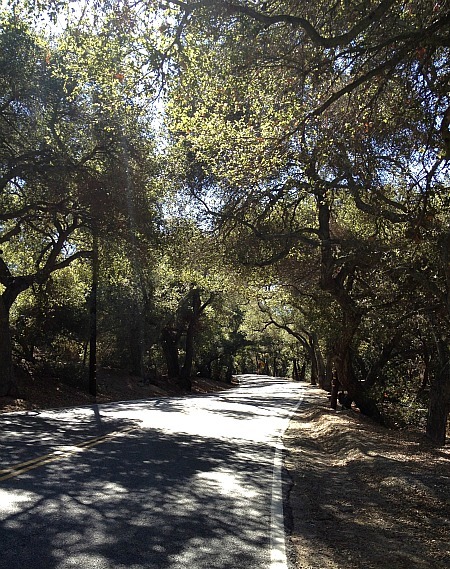 This drive (back in Trabuco Canyon) is simply stunning. Pausing to enjoy it helped ease the stress and anxiety I was feeling. It also reminded me that no matter who or what we vote for, we all have similar reasons to vote. We vote for freedom. We vote for democracy. We vote because we have hope (for a better future, a better planet, a better world for our children). Our definitions of what that world looks like may be different, but the feeling of hope is not. You can choose to see the rays of sunshine finding their way through the trees, or you can choose to focus on the shadows. Either way, both of them always have been, and always will be there. Posted in See and Do in OC, Wordless Wednesday and tagged green, light, Orange County, perspective, politics, sunshine, tree, voting. Bookmark the permalink. I’ve been purposely hanging back on the political front lately. It’s all a bit too much for me. It’s hard for me to even take it in – the division, the set-in-stone views and at times, outright hatred demonstrated by far too many. But, I feel compelled to jump back into the mix to dispel some of the myths surrounding Proposition 37 and urge you to vote yes. First, if you want more background on GMO’s, why they are a problem, what the issues are, and what’s at stake for our health and the health of our children, I highly recommend you watch the movie “Genetic Roulette“. It is a full-length movie, worth your time to watch, but for a good digested version, here is a ten-minute summary. For me, the supporters on the “yes” and “no” sides of a proposition are a clear signal of the way I want to vote. Here’s a little detail on each side. It’s important to understand who the “No on 37” campaign actually is. The two largest contributors are Monsanto ($8.1 million) and Dupont ($4.9 million) – the same corporations that told us Agent Orange and DDT were safe. If you don’t know who Monsanto is (I affectionately call them “the devil’s company”) check out this. There are also the junk food companies helping to bankroll the opposition such as Cocoa Cola, Pepsi, Nestle and Kellogs. There are in fact ZERO donations from actual people to the No side– they are all contributions coming from multinational corporations. On the yes side of the campaign are consumers, farmers, manufacturers, nurses, doctors and a lot of regular people (like me) who have contributed to the campaign. Proposition 37 started as a grassroots movement, with thousands of volunteers across the state. You can go here for a full list of supporters including the California Nurses Association, United Farm Workers, California Council of Churches, and the Sierra Club. But, even so, the “no” campaign, with millions in funding, is making a dent with their deceptive advertising and at times, outright lies. Some of my close friends and family – and even one voter in my own household (who shall remain nameless but is not me) – have been sucked in by the well-funded “No on 37 campaign”. They have approached me with concerns. Here are some of those, along with my response. False – Adding a few words to labels costs nothing. Labeling DID NOT raise costs in 61 other countries (including Europe, Japan, India and China) and won’t raise costs here. Read more about the costs of the proposition on this page of the CA Right to Know site. 2. Proposition 37 is poorly written and not strong enough. False – Proposition 37 requires labeling for the genetically engineered foods that are most prevalent in the American diet – food on supermarket shelves. The goal is to maximize the amount of genetically engineered food that is labeled while keeping compliance easy and keeping Prop 37 within the reach of California law. The exemptions in the law are easy to explain and guided by common sense. Read the Truth about Exemptions. False – According to independent legal analysis, Proposition 37 has been narrowly crafted in a way that provides “greater legal certainty” for businesses than other California consumer disclosure laws. It won’t invite frivolous lawsuits. 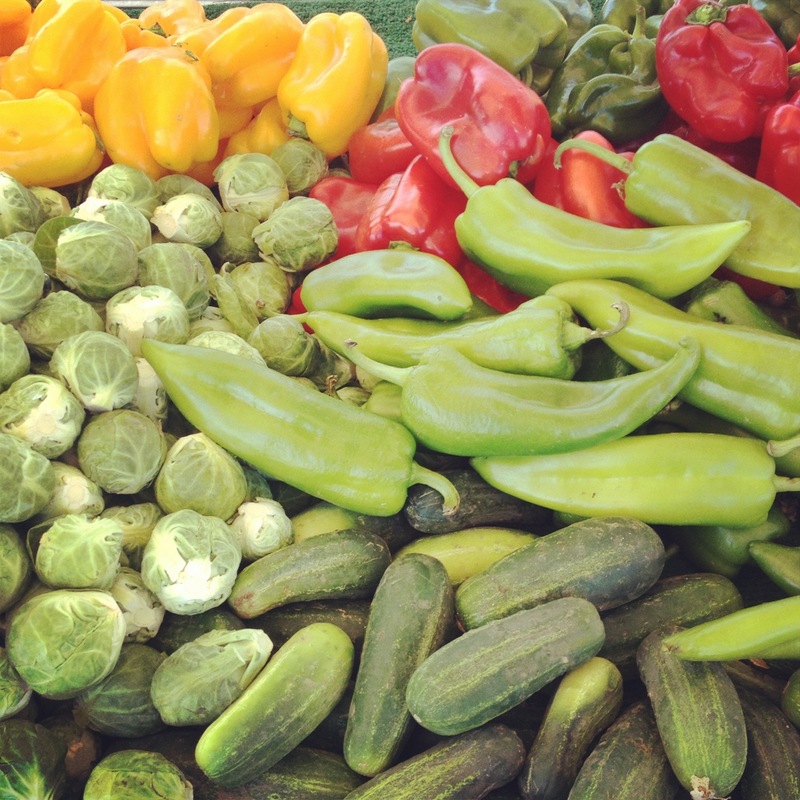 What it will do is help California consumers make more informed choices about the food they eat. This is about our right to know what’s in our food and the right to choose for ourselves what we eat and feed our families. It’s also about standing up for that right and being part of a greater movement that will spread beyond our state. This is our chance. This is our food. This is our future. Posted in Politics & Other "off limits" topics and tagged California, food labeling, GMO's, politics, Proposition 37, propositions, right to know, vote, voting. Bookmark the permalink. I’ve been thinking about politics and social media quite a bit lately. Some people don’t appear to mind mixing the two, but for most others, it seems like it’s a big no-no. At least once a day, I see a friend lament about too many Facebook political posts. Or another friend makes a well-informed, valid point, followed by and apology for getting political. I understand. I have done it too. And I know many of you don’t want to see it from others, or go there yourself. I get it. Personally, I don’t mind political posts. I find it interesting and enjoy reading other points of view. Yes, even if their views are different than mine. But then again, I’ve never been one to shy away from a spirited political discussion. I find our political process engaging, and frustrating, and fascinating. I’m so thankful to live in a country where it is all possible. However, not all political posts are good and/or welcome. Here, I would like to offer up a few suggestions for better mixing of politics and social media – not rules, but rather guidelines for making your politic posts go down a bit more smoothly. First and foremost, if you get the majority of your news from only one source and just spout off talking points from that one source, it’s probably best to keep it to yourself. Even I know the Fox News talking points – it’s not fair, and it’s not balanced, so don’t kid yourself. Neither is MSNBC by the way, so I’m not just picking on the far-right. That’s why I get all my news from the ridiculously smart and talented Jon Stewart. Kidding…well kind of. I do watch the Daily Show, well daily, but I also get news and information from the paper, articles, books, internet sources, and yes, occasionally cable news networks. Second, if you have expertise/passion/experience in a particular topic or issue, share it. None of us have time (or if we do, take the time) to research every angle of a political point of view or do homework on every one of the propositions. So for me, I like links to articles my friends have found, or their opinions about something that they have expertise in. As a matter of fact, I’ll go one step further – if you have experience and expertise on a particular topic, I think you should feel some sense of obligation to share with others so that they can make more informed decisions at the polls. But please, if you have not done any research or don’t have any experience aside from one segment to saw on the news, maybe just pass instead of hit “share”. Third, keep it positive, or funny, or preferably both. A bunch of “he’s a socialist”, “he’s an idiot” or “let’s just go start bombing people” posts really do nothing…for anyone. And also, they make you look like kind of a jerk. And finally, proper grammar and punctuation go a long, long way. A quick double check before hitting “share” makes the world a better place. Posted in Politics & Other "off limits" topics and tagged election, Facebook, opinion, political rants, politics, social media. Bookmark the permalink.